We've always intended to hike the nearby AT sections on the odd weekend here, and couple days off there. With the holiday season impending, it seems the appropriate time to break open the Keystone state on a couple of overnight hikes. Though the state is known for its sharp pointed rocks underfoot ("Pennsylvania - where boots go to die", says National Geographics), this is mainly a problem on the northern sections. We're psyched!
" The voyage of discovery is not in seeking new landscapes but in having new eyes." Caledonia State Park is our launch point, our car parked at the ranger's station about .6 mile from the trail (we're hiking this section southbound). I drop Coleen and the packs at the AT road-crossing before parking the car to walk back, on the way stopping for a pix of a beautiful tree in the park as the sun starts to break out). At 10:25, with clouds clearing rapidly we climb for the ridgeline, finding the trail along the right side of the ridge, with ramparts of stone towering to our left. Soon the sky has completely cleared, and though most of the trees have shed their leaves, the few still foliated are gorgeous against the brilliant blue sky. 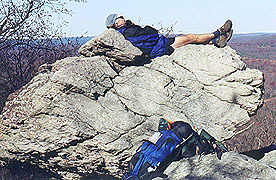 At noontime we find a convenient rock for our sumptuous sandwich lunch (taking advantage of the short trip and our light packs), topped off with Cadbury's chocolate. Sated far beyond the AT norm we continue, passing a grand institutional building off to the east, the South Mt. Restoration Center, which older maps refer to as a sanitarium. There's quite a crowd here, with busses waiting outside as if it's a tourist destination. 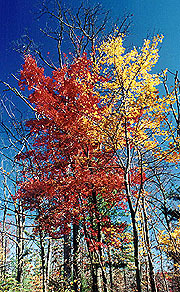 After some foliage pix here, we continue, arcing eastbound to flank the center's south border. The woods are full of tall, mature trees, but we pass several curious areas of massive blowdowns, all trees uprooted in the same direction as if by some mighty wind. The trail is full of weekenders, occasionally stopping to chat, and finally we come on the blue-blazed trail to the actual Chimney Rocks, where a rowdy group of boy scouts are just packing up to leave. It's a beautiful rock formation and overlook, and we take some pix here, with me getting quite adept at setting the camera's timer and getting atop the rocks within the allowed 12 sec. Our short break has become almost an hour, so we pick up the pace, bound for Deer Lick Run shelters for the night. Leaving the ridge we pass the Tumbling Run shelters (the traditional southern PA double shelters, a configuration we've not seen, and have yet to understand). 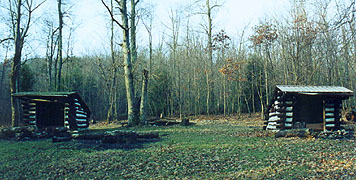 The scouts from Chimney Rocks are encamped all about the shelters, with the leaders inside, but they quickly offer to vacate one of them for our benefit. We're just stopping to read the register, but they clear a place anyway for a lady behind us coming here for the night (whom we passed at Rocky Mt. shelters). The path descends steeply to the historical Antietam Creek (site of one of the bloodiest, if inconclusive, battles of the Civil War) Here we find the next shelter - it's in a small town area, containing a small park, with a beautiful view of the creek out front, though it might be a mosquito breeding pond in the summer (it has a high-water path around, so it must flood occasionally). Dark is fast approaching, so we promptly climb South Mt towards the shelters, passing Mother Goose and her two dogs as we do. We cover the 2.4 miles in an hour exactly, suddenly coming on the privy and the shelters, which the trail bisects. Unlike the Tumbling Run counterparts, these two shelters face away from each other and lack the varnished floors, but they're clean, unclaimed, and more than adequate for our stay. 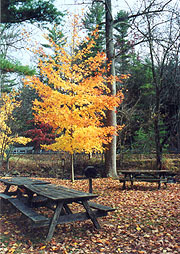 With the dry leaves around, fire starting is easy, and we pull over the picnic table close by the fire pit for dinner. We dine al fresco in the fading twilight, and as night falls we huddle near the fire for warmth, listening to Prairie Home Companion on the radio. The stars are brilliant as we relax over cocoa, and I listen to the Halloween fare, the station playing music with Halloween title themes, and some cute comedic bits interspersed. Coleen is mesmerized by the fire, but gets cold quickly and retreats to her sleeping bag, where I join her soon, turning in at 9:30. "But the darkness has passed, and it's daylight at last, and the night has been long--ditto ditto my song--and thank goodness they're both of them over!" Overnight we gain an hour with the change to standard time, and it seems a long night even before this. I'm in an endless rotation of short naps between position changes, although it sounds as though Coleen's sleeping well. We finally get up at 06:00 on hearing a hoot owl and seeing first light. There's a chill in the air, but none of our water bottles are frozen (her washcloth is, though). After oatmeal and coffee we delay to get pix of the shelters as the sun creeps over the horizon (it's the tidiest we've ever occupied a shelter in my memory). It takes forever in the cold, but finally we get our light and hit the trail, which unfortunately takes us level or downhill at this time when we really need to warm up. Worse, the wind, which had calmed last night, rose again this morning, rotating around to a headwind. We pass Bailey Spring, with an unusual small, decrepit shelter built over it, perhaps to keep the snow off. 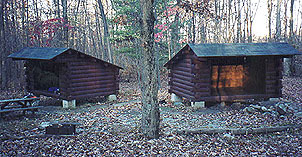 The traditional southern PA "His & Hers" shelters. Undoubtedly the tidiest we've stayed yet. Soon we hop over Dunlop Mt. - a welcome climb for warmth. On the other side, we enter the outskirts of town, passing several ramshackle homes before reaching the Mason-Dixon line, our entry point into MD. Within minutes we emerge to a beautiful overlook at Penn Mar state park, having made great time; and we take our am break here, once we find an area out of the wind. After some pix (there's a beautiful sunset pavilion and a sign showing the mileage to Springer and Katahdin) we hit the trail again, here an easily trodden road, remnant of the tourist complex here that once hosted 15,000 Lutherans for a picnic. The trail turns back into the woods, where we resume the annoyingly loud crunching of the leaves (hard to believe, but this really grates after a few hours, preventing all hope of seeing wildlife save the hundreds of chipmunks around). At the base of Quirauk Mtn a pair of day hikers are nursing wounds suffered at the hands of the slick leaves in the steep descent. At the top we find Nightingale and Gorp-Hater, a pair of section hikers like ourselves, though not quite so far along. We chat for quite a while, finding they're from Pittsburgh, with her a nurse like Coleen, but limited to weekend hikes. 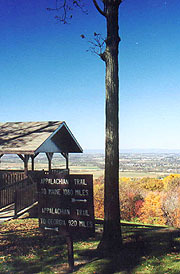 We have to be going though (besides, we're getting cold fast), and we head south on the trail, passing up the blue-blazed trail to High Rock (a haven for hang-gliders, but not with today's winds). After Devil's Racecourse shelter, a trail relo takes us over the beautiful Raven Rocks. They're an outcropping overlooking the opposite slope, where the yellow foliage in the tree tops (just catching the setting sun) stands in stark contrast to the black forest beneath. Resuming the steep descent, we cross MD 491, the autumnal solitude split by the roar of a pickup with huge wheels and no muffler - his din can be heard for most of the next hour. By now we're counting down the miles to the car, each landmark spurring us onward. We soon emerging at the powerline right of way for a stunning view and our last landmark. It's spectacular, but our elation is dampened to realize the trail does an about-face, marching straight up the slope behind us. It's a cruel joke by the trail-makers, as our destination lies but a short distance ahead, but we have to forge on up the impossibly steep slope nonetheless. Once atop, it follows the ridge crest back over to the next crossing of the powerline, this time returning on course down a gravel road. It's a short walk through the woods, past the new shelter, finding the trail to the parking area just ahead. Our chariot awaits. and to forge in the smithy of my soul the uncreated conscience of my race. Another overnight hike, this one we've planned to hike north from Caledonia to Pine Grove Furnace. As I walk from our parked car to join Coleen at the trailhead, two deer leap across the road just in front of her, a quick reminder that it's the 2nd day of deer season here. We mount up and hit the trail (11:38), remarking to each other how wonderful it is hiking through state and national parks. Caledonia is a beautiful park, replete with conifers and streams, but all too soon we're leaving, with a welcome opening climb warming us up before the ridge walk. Typical of PA it's a great trail with minimal elevation change, and we pass large rhododendron groves followed by thickets of mountain laurel. 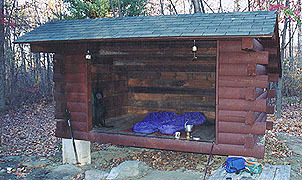 In an hour we arrive at the Quarry Gap shelters, the most picturesque shelters I've seen on the AT yet. 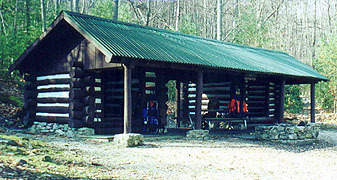 They're traditional PA twin shelters, though joined by an awning covering the dining area between, and each is extremely clean and well-sealed against the elements. Sitting here is Odin, about to complete his flip-flop on arrival at Front Royal. After profuse congratulations we chat a few minutes, seeing in the register a note from Spike which indicates they're still on the trail (we later find that we just missed Aimless & Sirocco heading south, who we met in Erwin, TN). The hunters are out en masse and soon we pass a beautiful pine grove, followed by a burn area equally beautiful in its simplicity - the understory gone, leaving only the ground cover and the taller rebuilding trees. During our pm break, I find we've left the map behind in the car - a setback, though the trail is well-marked, and we've enough memory of the details to have a good idea of our progress. Descending off the ridge, we pass the locked Milesburn Cabin, with a sign indicating we've 2.36 miles to go to the Birch Run shelters, our planned stop. We do this in just under an hour, although the 1st shelter appears occupied by a hunter huddled in his sleeping bag, his dog aside. He barely waves as we pass on to the 2nd shelter (far less level, but fine), where my priority is finding firewood before dark falls. It's a challenge, but soon we have a modest pile, and I get a fire going despite the blustery wind (though it frequently blows smoke into our shelter). As dinner's finishing, our neighbor drops by, and we find he's Amtrak (with dog Hayden), finishing his flip-flop in Harper's Ferry. They started Apr 15, having hiked some with Odin, though he can't recall Spike and Caveman. We chat around the fire for a bit, and Hayden makes his best attempts at foraging food, to which we eventually succumb. Amtrak heads back over for his own dinner, and we get cold fast. Our new Nuptse jackets keep our torso's warm, but don't help much for legs and hands. We have some soup, and turn in before its heat wears off, with me taking journal notes while Coleen tries to adjust her sleeping bags for warmth. I have more success than she, but when I head back outdoors to drain the water bag, I'm shivering instantly. I hurry back to the sleeping bag, with lights out at 8:30. Hear the challenge, learn the lesson, pay the cost." I got some reasonable sleep during the night (I recall quite a few dreams), though all of it in short shifts. Coleen never quite got toasty, and my down jacket over her feet ultimately ended up on the ground outside the shelter. We're up at 06:45 as it gradually turns light, and I get the water started promptly (it's not frozen). Just as it boils, Coleen accidentally kicks over the pot, forcing us to restart, but soon we're eating. As we do, I see Amtrak and Hayden heading out stealthily (a disappointment - I wanted a pix), so I yell a farewell, and with a wave they're gone. The register has an entry from the 3 Amigos showing that Red Horse is leaving them at Harper's Ferry, and that they've all just had a good cry over it (we're sorry to hear it as well). It's a chilly start, and we're both glad for the 1st uphill to warm us a bit (there's a light frosting in the shaded areas). At Shippensburg Road we find a bulletin board with a map, and as we stand memorizing it, a husky gent pulls up in an SUV to warn us about the dangers of walking in anything other than orange (in spite of our bright red bandana's draped over our packs). After appropriate remorse, we continue under cloudless skies, though the trail is featureless save one small, recovering burn area we pass. There's a few minor PUDS, and soon we're at the Tom's Run shelters for our am break. As we write in the register a hunter pulls up, waiting here for his uncle. We chat of the place's reputation as a POW camp in WWII, and of the shooting of two lesbians as they consummated their relationship here in 1988. His uncle arrives soon and joins the conversation, having met Earl Schaeffer (1st AT thru-hiker) as he hiked through on a repeat hike a few years ago. We have to pry ourselves away, but we're making good time, and soon enter a community of summer cottages that marks the park boundary. From here it's a short walk to a waiting car that signals the end of our short adventure and our completion of a full quarter of the trail. 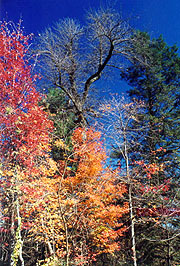 Katahdin in 2003!! 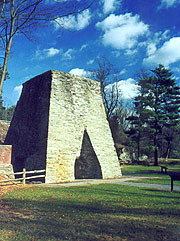 Pine Grove Furnace, a historic munitions factory near the halfway point on the trail.